Wow what a busy weekend!! We had the groomers out running all night each night since Thursday!!! I personally want to thank all of the sponsors and volunteers!!! Without them this event would not have happened!!! It was alot of work but was an amazing and fun weekend!!! WE have been working on getting the trails all re-groomed after this weekend’s Sled Rally we did have two minor mechanical failures that has slowed us down a bit. The Summit and Goodwin Lake trails have been done from town to the Summit Cabin. In the North we groomed the Carson Lake Loop (Rally Route) We will be out grooming the rest of this week if the weather cooperates. What an event! World Snowmobile Invasion was a huge event and a huge success. Thank you to all the organizers, volunteers, sponsors, riders and fans that made it happen. 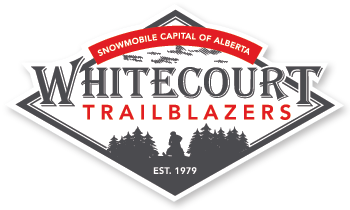 For a day-by-day review of events and highlights, check out the Whitecourt Trailblazers Facebook page – you don’t need Facebook to view the page so check it out! World Snowmobile Invasion is this week!!! The snow is epic, the weather forecast is amazing should be a crazy awesome week!!! Groomers have been out everyday getting the trails ready and the conditions are GREAT!!! Tickets for the World Snowmobile Invasion are going fast, So get yours TODAY!!! Whitecourt Stationary, Adrenaline Powersports, RPM Powersports until Tuesday, February 10 at 5pm and then at the WSI Ticket Trailer located at the Canadian Tire Welcome Centre (Seniors Circle) starting Wednesday, February 11. The Groomer saw its shadow this morning so 6 more weeks of snowmobiling!! Recent snow has improved the trails considerably. Groomers continue to travel around entire trail system. Trails are a little icy under the new snow but in good condition. Remember the World Snowmobile Invasion ticket packages are going fast…get yours today.